In PCB circuit assemblies the trend is moving to more SMD components with finer pitch connections. The majority of the assemblies still have a small amount of through hole (THT) components. Some of them cannot withstand high reflow temperatures, while others are there because of their mechanical robustness. In automotive applications these THT components are also present. Many products for cars, including steering units, radio and navigation, and air compressors also use THT technology to connect board-to-board, PCB’s to metal shields or housings out of plastic or even aluminium. This is not a simple 2D plain soldering technology, as it requires handling, efficient thermal heating and handling of heavy (up to 10 kg) parts. Soldering technology becomes more 3D where connections have to be made on different levels. For this technology robots using solder wire fail because of the spattering of the flux in the wires and the long cycle time. In wave soldering using pallets the wave height is limited and pin in paste reflow is only a 2D application with space limitations. Selective soldering using dedicated plates with nozzles on the solder area is the preferred way to make these connections. All joints can be soldered in one dip resulting in short cycle times. Additional soldering on a small select nozzle can make the system even more flexible. The soldering can only be successful when there is enough thermal heat in the assembly before the solder touches the board. A forced convection preheat is a must for many applications to bring enough heat into the metal and board materials. The challenge in a dip soldering process is to get a sufficient hole fill without bridging and minimize the number of solder balls. A new cover was designed to improve the nitrogen environment. Reducing oxygen levels benefits the wetting, but increases the risk for solder balling. Previous investigations showed that solder balling can be minimized by selecting proper materials for solder resist and flux. The goal of this project is to establish a robust dip soldering process with short cycle times. This can only be achieved when improvements are made to eliminate the potential defects: poor hole filling, bridging and solder balling. A nitrogen blanket system is designed to generate an inert atmosphere in the soldering area, thus reducing oxides and improving wettability. Two new concepts are introduced to eliminate bridging when the assembly is tilted out of the liquid solder. • more shiny solder joints. The second improvement is the nozzle design. The nozzles are made of stainless steel, a non-wettable metal. The metal will repel solder and increase the risk that there will be a short between two or more pins of a connector. To migrate the solder from the pins, a strip made out of a wettable material is placed in the nozzle. The alternative for a wettable strip mounted in the nozzle is to install a stainless steel laser cut screen on top of the nozzle. The screen has apertures where the pins of the connector are located. The screen will be a barrier between the pins and between solder and solder resist on the solder side of the board. It prevents the solder from sticking to the solder resist of the PCB and thus eliminates the formation of solder balls between the pins. Since the material repels the solder there will be no bridging between the pins of the connector. This experiment is done to optimize the soldering process with the modified nozzles. The dip soldering process is sensitive for bridging. Vertical dip of the connectors becomes even more critical when fine pitch connectors with long leads are soldered. In the experiment the two concepts, wettable strips and screens, are compared to one another. 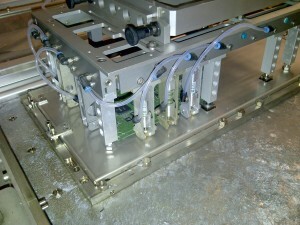 The objective of the experiment and of the dip process is to have no bridging or opens and eliminate the solder balling. Since nitrogen is an important parameter it is selected for this experiment. The absence of oxygen not only supports the flux, but also prevents oxidation of the solder. The nitrogen cover improves the inert conditions at the soldering area. As part of this experiment three levels are investigated: a cover with 35 and 70 l/min nitrogen versus no nitrogen cover. The flux in the experiment is a low VOC flux with 20% water content. It is a very reliable flux that is used in many selective soldering applications, but not strong/aggressive which makes it beneficial to use nitrogen. The preheating is the process part where the flux is activated. Two concepts of preheating are popular in selective soldering. IR lamps are commonly used to heat up a board. Forced convection is a more complicated method in a selective process, but brings more heat into high mass assemblies and results in a smaller temperature difference between small and large, high thermal mass components. Both methods are part of the experiment and heat up the assembly to 120ºC on the topside of the board laminate. The selected flux amount is the recommended value of the supplier and another setting is 15% less flux. The test is done on a multimedia board from an automotive supplier that runs this assembly in a high volume production line. Soldering performance was good. Only some solder balls were observed. The data shows that nitrogen has a big impact and lower oxygen levels generate less solder balls. This is in contrast with previous findings in wave soldering processes. Most likely it improves the flowing properties of the solder and the flux activity. Previous research showed that the solder resist has the most impact on solder balling. Improving the solder resist was not part of this project.The convection heater benefits the soldering and also results in less solder balls. A minimum of solder balls is achieved when the test board is preheated with the convection unit and soldered with a nitrogen cover having nitrogen supplied of 70 l/min. The data indicates that wettable strips generate the lowest solder balls. However the interaction between the screens and nitrogen is a significant factor. The interaction plot clarifies the performance of the screens. Screens require a certain inert atmosphere. This is achieved with the nitrogen cover and 70 l/min. At that condition the screens give a very stable process with a minimum of defects. This is confirmed by the data from users. For lower nitrogen consumption there is a risk that a small oxide film will show up on the solder. This oxide film may impact the performance of the screen. 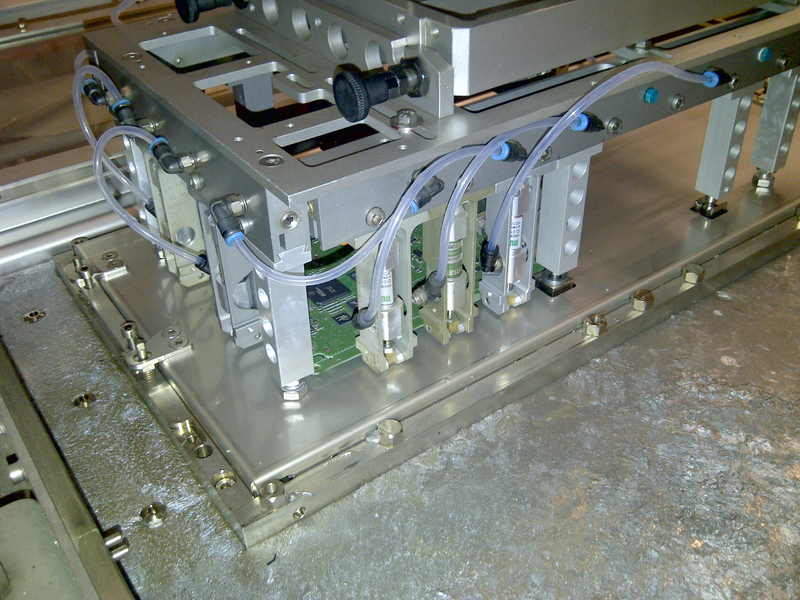 The nitrogen cover definitely opens the process window for the multi wave dip soldering process. All soldered boards showed 100% through hole filling meeting the IPC-J-STD-610 criteria for class 3. Adding screens or wettable strips to the nozzles also eliminates bridging defects. If the nitrogen cover is not used the wettable strips are still able to solder without bridging. The best results using the screens are achieved when the nitrogen cover supplies 70 l/min. All remarks are applicable for this board only and should be reviewed for other applications. Note 1: Strips are not sensitive for atmosphere. With or without cover gives the same scores. Note 2: When a cover is used with 70 l/min nitrogen the scores for screens are similar to wettable nozzles. Note 3: Cover with 70 l/min nitrogen is the best for this test board. The most robust process will be achieved with nitrogen covers and 70 l/min consumption. The lower flux amount is better for this assembly as well as the forced convection heater. Solder resist is a critical material for solder balling and for the spreading of the flux. The data shows that the wettable nozzle also performs well when there is no cover installed. This makes it possible to retrofit nozzle plates in the field and improve yields without big investments. It is nice to have good scores in experimental environments, but it is essential for success that the achieved nitrogen condition remains stable during mid-size and high volume production as well. In a production environment there are two statuses: the machine is on standby waiting for a product, or the machine is soldering an assembly. In the standby status the oxygen levels are consistent below 50 PPM and depend on amount of nitrogen and the purity of the supplied nitrogen. The new cover returns equal scores of remaining oxygen in comparison to the standard design. During production the cycle time has an impact on the oxygen level. For this assembly the process was very stable for a cycle time of 60 seconds. In this process there was enough time for the system to stabilize in between the soldering of two boards. The next figure shows the increase of oxygen during soldering, but in the soldering phase the PPM oxygen was 100 or less. After the board was soldered the system was able to recover the low oxygen level before the next board arrives. For high volume production (soldering boards every 30 seconds) there was a drift of oxygen noticed using the 70 l/min. The amount of nitrogen was not sufficient enough to keep the oxygen level below 100 PPM for conditions where opening and closing of the system was very frequent. An increase of nitrogen to 100 l/min was enough to have a consistent oxygen level as shown in figure 9. The new nitrogen cover design is a major improvement for the multi-wave dip process. Remaining oxygen levels are much lower (<100 PPM O2) and consistent even at high process cycles. In static mode (glass plate closed for longer time) the PPM levels reduce to the same low values as in the previous design (10 PPM and lower). nitrogen flow; wave on; nozzle plate/cover design; cycle time (interval between open glass plate).